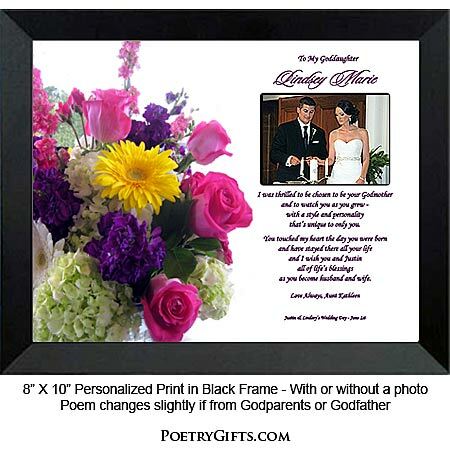 One-of-a-kind personalized wedding gift from the Godparents that is sure to become a lasting keepsake. Personalized with name, date & photo. Beautiful wedding gift for a special Goddaughter. You've been an important part of her life since her Baptism and now she is getting married. 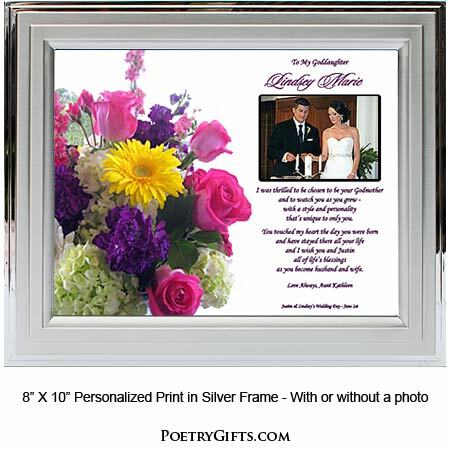 Our Exclusive "To My Goddaughter" Poetry Gift is a great way for you to extend your best wishes to your special Goddaughter and her husband. 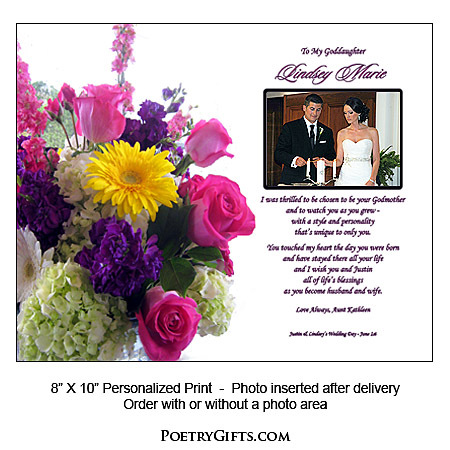 The touching verse can be personalized with names, optional wedding date and a special message from you. Personalize the gift even more by having the bride and groom place one of their favorite photos in the cut-out photo area after the wedding. Your thoughtfulness will surely touch your Goddaughter's heart. 4. 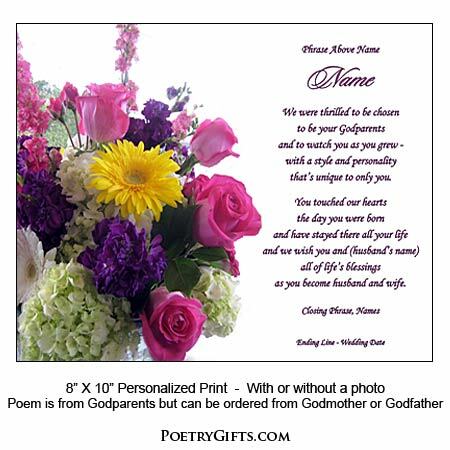 Closing Phrase and Your Name(s) (as seen after poem) - Examples: With Love on Your Wedding Day, Aunt Kathy & Uncle Sean; Best Wishes, Michelle; etc." 5. Optional Ending Phrase and Wedding Date - (Example: Lindsey and Justin's Wedding Day - June 1st)"
I am so glad I found this site! This is the second thing I have ordered in just weeks. First was the baptism framed poem with picture opening for our Grandson and now this framed poem with picture opening for our Goddaughter. Both are gorgeous and look more expensive that they are. Very nice looking gift. Impressive and special. We are proud to be giving both as gifts for very special occasions. Thanks! I was looking for something unique yet still having some personal touch for my goddaughter's wedding shower. So I was thrilled to find this website and the poem. It really expresses so well my feelings and wishes for her. Ordering was easy and it came exactly within the time frame stated. I have bookmarked the site for future reference. Thank you.